RocTool, the technology and manufacturing solutions provider, enriches its range and launches new RocTool Performance Cooling (RPC) units! They are used to complement its induction heating process for plastic injection and composites processes. “RocTool Systems & Engineering teams have developed a wide range of new performance cooling units to meet the manufacturers’ growing demand in our Heat & Cool technologies in production globally” says Jean-François Martinez, RocTool’s Manager for Systems and Peripherals. 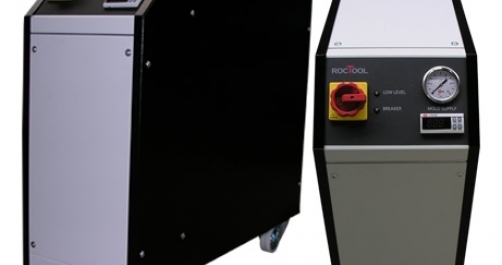 The heat & cool technology leader now offers a wide range of equipment designed to deliver high performance cooling, mainly for RocTool technology users and the new C-series has been designed specifically for RocTool processes. Dedicated to both plastic injection and composites processes, the units are easily controlled by RocTool’s tactile interface. Especially designed for RocTool composite processing, the C-series has been developed to improve the complete cycle time by purging the water from the mold in order to reduce the heating time and managing the water flow during the cooling time. “Our C2V unit is used with a water pressure network higher than 3 bar at 100 l/mn, when our C6, C12 and C24 units are used with a water pressure network at 3 bar maximum, the flowrate depending on the model chosen. During the purging sequence, water mixed with compressed air is sent back to a tank to prevent any turbulence in the water network” adds JeanFrancois Martinez.